The purpose of this pilot study was to assess the non-contact effects of a NaF varnish on the morphology and elemental compositions of sound and demineralized dentin in an in vitro pH cycling model. 3 mm diameter dentin cores were extracted from bovine teeth, mounted in acrylic rods, and ground and polished. Sound and demineralized (in 10 mL unstirred 50% citric acid (pH = 1.2) for two minutes) specimens were divided into four groups (N=6) corresponding to treatments with either water (control group) or non-contact Vanish® 5% NaF White Varnish with tri-calcium phosphate (3M ESPE). For the non-contact varnish group, one 0.50 ml unit-dose was applied to acrylic rods and positioned in the same stopper as three dentin specimens. The four groups were then cycled in a regimen consisting of three rounds of one-hour treatments with each round followed by immersion in a three-minute static acid challenge (0.3% citric acid, pH = 3.8). For each one-hour treatment immersion the test groups were immersed in distilled water. The specimens were thoroughly rinsed with distilled water after each treatment and after each acid challenge. After the last challenge, specimens were rinsed with distilled water and immersed in artificial saliva (AS) overnight. All treatments, acid challenges and immersion in AS solution were performed in an incubator set at 37°C. After three days, the specimens were assessed using scanning electron microscopy (SEM) and energy-dispersive X-ray spectroscopy (EDS). SEM and EDS results demonstrated the non-contact varnish group can provide mineralization benefits relative to the control group for both sound and demineralized dentin substrates. Depositions from mineral eluting from the varnish developed on the intertubular and intratubular regions alike, with the most prominent depositions appearing on initially demineralized dentin. 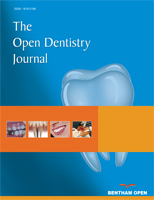 In this observational study, acid-resistant mineral depositions were produced on the sound and dentin surfaces without direct application from a multi-mineral varnish containing fluoride, calcium and phosphate. Keywords:: TCP, NaF, pH cycling, remineralization. © Karlinsey et al. ; Licensee Bentham Open.